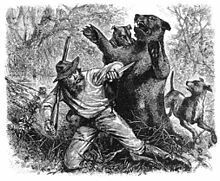 Few stories are as remarkable as the tale of Hugh Glass, an early mountain man, who was left for dead after a lethal grizzly bear attack. Although deserted and severely injured, Glass managed to crawl almost 350 miles to Fort Kiowa, surviving without weapons, companions, or food. Little is known about the early life of Hugh Glass. It is believed he was born in Pennsylvania between 1775 and 1780 and went to sea when he was around 20. His ship was captured by pirates and Glass worked for buccaneer Jean Lafitte until 1818 when one night he jumped ship on the Texas coast. He made his way through Comanche and Kiowa territory, but was captured by Pawnees. Glass gave the chief a gift of cinnabar (prized for its use in making red war paint) and saved himself from a death of being burned alive. In 1822, Glass escaped the tribe and joined the Ashley-Henry Fur Company. The mountain men did what they could, bandaging his wounds and stitching them up, but they all assumed he would die. 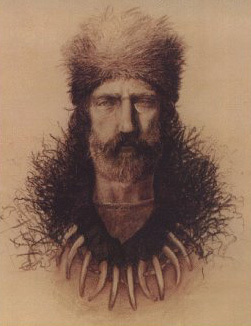 Andrew Henry, the group leader, recruited John Fitzgerald and a teenage Jim Bridger to stay with the wounded man and to bury him after he died. Fitzgerald and Bridger waited in a side canyon of the Grand River, but after a few days he’d developed a high fever. Deciding the man would soon die, Fitzgerald and Bridger took Glass’s rifle, knife, tomahawk, flint, steel, powder, and lead, and left him. Glass though, did not die. When his fever broke, he ate buffalo berries and killed a rattlesnake, pounding the raw meat until he could eat it. As his strength grew, he vowed to survive and take vengeance on the men who’d abandoned him. Unable to walk, Glass crawled almost 350 miles to Fort Kiowa, surviving at one point by rolling onto a rotting log and letting maggots eat his infected flesh. He reached the fort and eventually forgave Bridger, saying he was too young to kill. He found Fitzgerald and retrieved his riffle, but was unable to kill the disreputable swine because the man was enlisted in the army. In 1833, Glass was killed and scalped near Fort Cass by a party of Arikara warriors. Frontier Medicine from the Atlantic to the Pacific, 1492-1941, David Dary, 2008, pp 103-104. This entry was posted in 1823 and tagged Grizzly Bear Attack, Hugh Glass, Mountain Man. Bookmark the permalink.